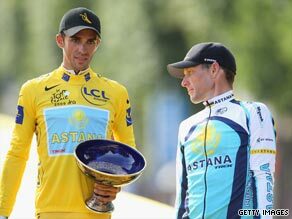 Tour de France winner Alberto Contador has launched a stinging attack on Astana teammate Lance Armstrong after returning as a hero to his native town of Pinto near Madrid. Contador told a news conference that relations between the two riders were tense throughout the race, making the atmosphere very difficult for the team as a whole. Although not giving specific reasons why, Contador admitted the situation has affected his relationship with the American. “My relationship with Lance Armstrong is non-existent. Even if he is a great champion, I have never had admiration for him and I never will,” the 26-year-old Spaniard admitted. “It was a delicate situation, very tense, the two riders who had most weight on the team did not have an easy relationship and that puts the rest of the technical staff and the riders in an uncomfortable position,” he added. The Spaniard, who also won the Tour in 2007, compared the situation with that of Formula One drivers Fernando Alonso and Lewis Hamilton at McLaren when they were colleagues. “That situation in some way illustrated what I have experienced. But I knew that if we kept a cool head everything would be OK,” he added. Contador eventually finished the race over four minutes clear of Luxembourg’s Andy Schleck, with American Armstrong — who was riding in his first Tour since completing the last of his seven wins in 2005 — a remarkable third. It was Contador’s fourth successive grand tour victory, after he also won last year’s Giro d’Italia and Vuelta Espana following the Tour organizers’ decision not to invite the Astana team to the race.